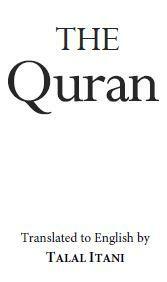 The Qu´ran – a modern English translation as a free PDF e-book. Here is a new translation of the Quran by Talal Itani, who kindly offered Holybooks.com to post it as an ebook. Talal Itani first read the Quran 1992, in order to discredit it. Since then, Talal has been studying the Quran, researching it, and teaching it to others. Talal decided to translate the Quran when he gave up all hope of finding an English Translation that is at the same time highly accurate, and very easy to read. This is the result. We have several other translations of the Quran, this one though is recommended for new readers. Talal decided to translate the Quran when he gave up all hope of finding an English Translation that is at the same time highly accurate, and very easy to read. You can buy the print version here: Quran in English: Clear and Easy to Understand. Modern English Translation. I learned the Quran by reading the English translations. I do not regret what I did. That was my only way. Pls I cnt download english Quran with my Nokia C3 pls help me out. This is my emai: princeisyaku@yahoo.com. The sentences in the epub are all mixed up! The PDF works fine though, thanks! so we need you help of translated qurans and non translated qurans so we can help buit agret islam foundation and allah will suerlly bless you . just cant download quran…tell me how to…? Here is link to download in pdf. Thank you! I found it easiest to download the mobi. version from this site. Its seems worthless. It would have been nice to have a Koran in modern English but none of the files work–at least the ePub and MOBI files don’t work. I am veryhappy to introduce myself for your kind consideration.you have done a Great work for the modern World spreading the Divine Verses of Islam.I pray almighty Allah to encourage you and your team in this great service. شيخ سليمان بن رياض السيلاني. 1. In the name of God, the Gracious, the their hearing, and over their vision is a Merciful. veil. They will have a severe torment. selves, though they are not aware. of those who are misguided. The EPUB does not download ! I finally got what I am looking for The Holy Quran. Thanks for the bottom of my hear Talal Itani. I am Rabiu from nigeria kaduna state.Salaam to all bealievers!!! Please who is Jesus christ In Islam? Jesus Christ is considered as the Prophet of Allah in Islam. In Islam, his name is Hazrat Is a. Excellent resource for Learning online Quran with modern translate. I think there is a lot of Quranic apps who provide Online Quran with translates different languages as well. I have to download Duaoazkar https://duaoazkar.com/ from google play store its amazing for all Muslims. I read daily Quran Pak after salah and then Almanzil https://almanzilpro.com/ dua for save black magic and jinn.